ToolTopia.com is based in Louisiana. When I ordered my new S-K 3/8-drive socket set (#94549, $138) on Monday I figured I’d be lucky if it arrived by Friday…tomorrow. Once the FedEx shipping information was available online, I saw that tools were coming from Fresno, California. Free ground shipping had the tools in my hands in just two days. Nice. Initial fondling was pleasurable and confidence inspiring. I like the fitted plastic case the tools come in, and the ratchet has a better feel to the clicks than anything in my modest toolbox. The ultimate test will be after use and over time, but I like them. My friend Paul, who used to make his living turning wrenches on diesel trucks and buses, was with me when I opened this late Christmas present, liked the ratchet as well. Paul’s tool knowledge is more complete than mine. He likes the direction changing dial better than the now common lever because it doesn’t inadvertently change directions, particularly at the most inappropriate time when tucked into a tight place. I’ve experienced an inadvertent direction change many times, often with my ratcheting combination wrenches. I was surprised that I didn’t dislike the direction change dial on the round-head-fine-toothed (RHFT) S-K ratchet like I’d anticipated. Maybe this is because the RHFT dial-actuated ratchets I used decades ago were cheap? My memory is that the dial needed to be turned 90-degree or more and were rough? The S-K ratchet needs about a quarter turn to change from on to off, and feels smooth. Again, use will determine my long-term opinion, and a more detailed review will need to develop. S-K 19733 hex bit set. 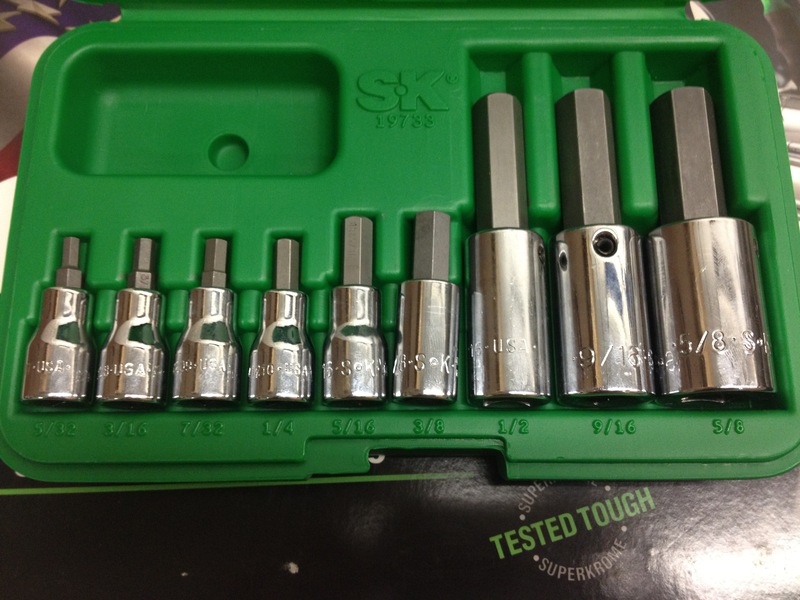 For $16.00 extra I purchase the S-K 94549A kit that “includes” the 9-piece SAE S-K 19733 hex bit set, which ToolTopia.com sells separately for $66.00. So for $154.00 I received a pretty complete 3/8-drive socket set, and a nice hex bit set that goes from a small 5/32″ to a rather large 5/8″. Am I the only one that sees this as a very good made-in-USA value?